The PI's Perspective: Pinch Me! 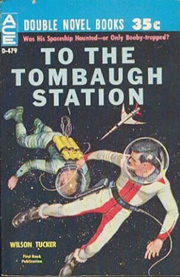 The cover of a science fiction paperback published in 1960. Sometimes we forget how pivotal the discovery of planet Pluto — the harbinger of the Kuiper Belt and the first-discovered dwarf planet — has been in popular culture, in addition to its role in transforming planetary science. New Horizons is healthy and on course. In mid-March, our spacecraft passed the orbit of Uranus, more than 19 astronomical units (AU) from the sun. In fact, we’re now almost 20 times as far from the sun as the Earth is. If you were to make a scale-model solar system in your neighborhood, with the sun at the location of your home, and the Earth at your neighbor’s house, then New Horizons is 20 houses down the street — way, way out there! Imagine that — I mean, pinch me, we are really far now! Although we still have about 12 more AU (or in my analogy above, “houses”) to go to reach our rendezvous with Pluto in 2015, some 32 AU from the sun, you can see that we’re very far into the journey. As we continue that journey through 2011, there’s much more going on than just mileage markers and planet crossings. Our next big milestone is a nearly two-month-long annual wakeup of our spacecraft from hibernation that begins May 9 and concludes July 1. 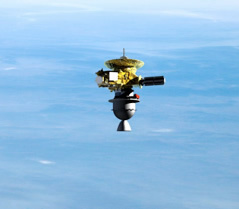 During that wakeup we’ll check out the spacecraft’s prime and backup systems as well as the seven scientific payloads. We’ll also do a great deal of spacecraft tracking to refine our knowledge of our exact trajectory to evaluate whether we’ll need a small course correction next year, like the maneuvers we made in 2007 and 2010. We’ll also update our fault detection and protection software in preparation for the Pluto encounter. Speaking of the encounter, we’ll conduct a special encounter-related test on May 20 using our radio science experiment. Something very rare and special happens that day — the Earth, as seen from New Horizons, will be “occulted” (that is, blocked) by the moon. This will allow us to practice, for the first time, the type of radio occultation we'll perform at Pluto and Charon. Only three such alignments occur along our journey to Pluto, and they all happen in 2011 and early 2012. We’re looking forward to the May 20 test very much, because it’ll help us work out any bugs in our Pluto and Charon occultation plans and provide a good simulation for the Deep Space Network team that has to aim its giant antennas precisely at New Horizons and transmit the special signals to create the occultation experiment. We’ll conduct a similar test next January to further refine our procedures and techniques. New Horizons launched from Florida and was propelled onto its Pluto-bound trajectory on January 19, 2006, by the Boeing-built upper stage to our Atlas V launch vehicle. And there’s more going on still. Most importantly, in my mind, is that this month, and throughout summer and fall, we’ll use huge telescopes to search for the Kuiper Belt objects beyond Pluto that we’ll visit in our extended mission — assuming one is approved. We’ll have more to tell you about that in upcoming news notes. We’re also putting the final touches on the eight days of encounter sequencing that fall just before and after our nine-day-long “core” load near Pluto closest approach. Once we complete this in late 2011, we’ll sequence the previous 17 days of approach to Pluto that take us from 21 days out to four days out. The design, implementation and testing of these encounter timelines and command sequences requires exquisite attention to detail and long hours of careful work by many people on the project. We’ll have more to say about that later, too. Something else of note: In late June, New Horizons team members led by Drs. Leslie Young and Cathy Olkin will head to Australia to record a new set of stellar occultations of Pluto, Charon, and possibly even Pluto’s small moon Hydra. These events will tell us whether Pluto’s atmosphere is beginning to cool and collapse to the surface, as some scientists have predicted, and allow us to refine knowledge of the sizes of Pluto, Charon and Hydra. I know that when Leslie and Cathy are doing these observations, their thesis advisor, MIT’s Jim Elliott, will be on their mind. Jim, one of the leading planetary astronomers of his time and part of the New Horizons scientific collaboration team, passed away last month — a tragic loss for both his family and planetary science. Our condolences go out to Jim’s family and many colleagues. I’ll conclude my update with a shout out of thanks to all the people who work on New Horizons today, and all those who worked on it when we were building and launching the mission. 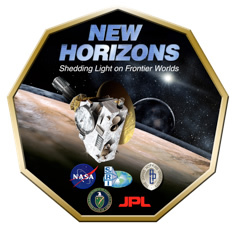 The New Horizons team consists of people from dozens of organizations, the most prominent of them being NASA itself; the Johns Hopkins Applied Physics Laboratory, where our spacecraft was built and is operated; Southwest Research Institute, where the mission and science team are led; the Jet Propulsion Lab, which assists our partner KinetX in mission navigation; and the Department of Energy, which produced and fueled our radioisotope thermoelectric generator (RTG) power supply for launch. More than 2,500 people across the United States, from dozens of companies, universities, national labs and NASA installations, have been directly involved in the project. To all of them we all owe a great debt of appreciation. They made this epic journey across the abyss of our solar system possible. Almost before you know it, in 2015, their handiwork will revolutionize what humankind knows about the Pluto system, dwarf planets and the Kuiper Belt. And just like the milestone of passing Uranus’ orbit and knowing we only have one more such milestone ahead (at Neptune) before we reach our goal, sometimes I have to pinch myself about what a wonderful enterprise space exploration is, and how mounting a journey like ours requires the expertise and dedication of so many people.